Westeros is the beating heart of A Song of Ice and Fire. 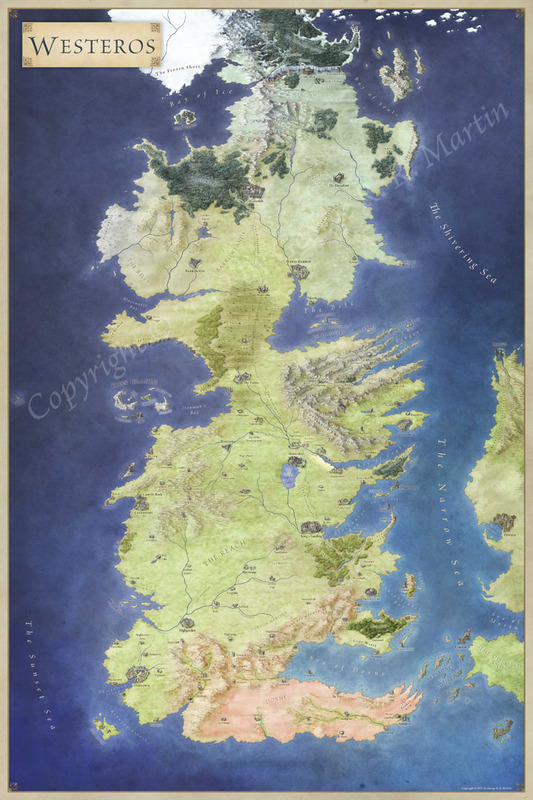 In this map Westeros gets its own official map in the form of a 3 foot by 2 foot poster. 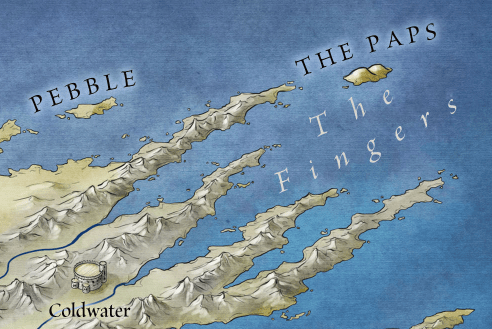 As with the maps of the Free Cities, Slaver’s Bay and the Dothraki Sea, in this map each settlement is illustrated rather than being marked with an icon. I had a great time trawling the references (mostly westeros.org) to pull out the distinguishing features of the different towns and castles. Each major family has a castle, and those castles are often distinctive – so here’s a quick tour. The Eyrie sits at the heart of the Vale, perched atop the mountain. The road to the Eyrie is guarded by the three towers of Stone, Snow and Sky before reaching the castle itself. 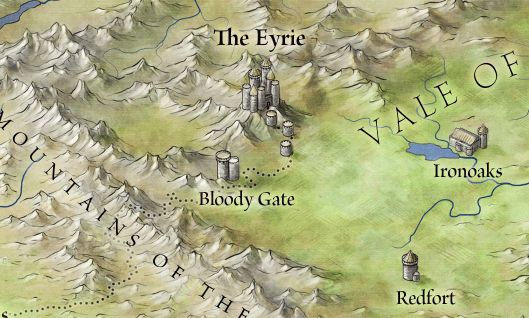 They Eyrie watches over the Vale of Arryn – a patchwork of fertile farmland locked away from the troubles and tribulations of the rest of the Seven Kingdoms by the Mountains of the Moon. Harrenhal is a monster of a castle, with multiple keeps and towers that bear the scars from centuries of depredation and war. It looms at the top of the Isle of the Faces, near the mouth of the Trident and straddles the Kingsroad. It’s key location makes it strategically key, with many major players based here over the course of the war, but it also holds a curse. Those that hold Harrenhal tend to come to bad ends. 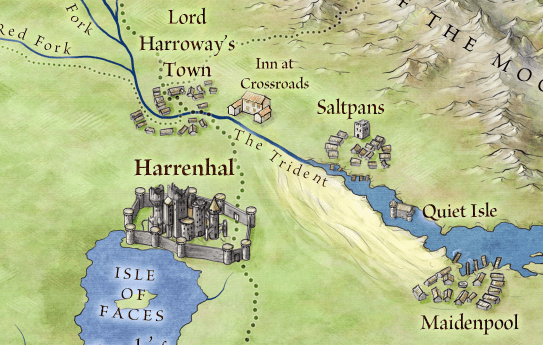 North of Harrenhal lies the Inn at the Crossroads. “Of all the Inn’s in all the world…” – everyone seems to stop here. Westeros is a big continent. And yet many of the main characters can’t but help running into each other here. As a result, it gets a work-up as a classic courtyard inn with stables in one of the wings. Casterly Rock is an odd case. The Rock stands over Lannisport and is the family seat of the Lannisters. 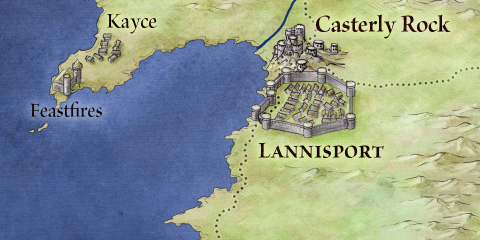 However, with their land grab for the Iron Throne, Casterly Rock becomes more of a retreat for the family, the place where those who fall out of favour are banished. 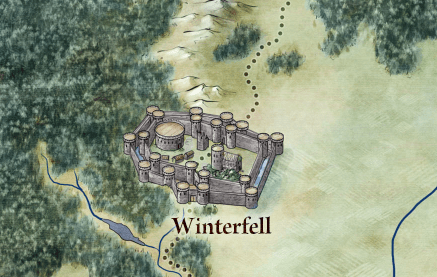 And then, of course, there is Winterfell. 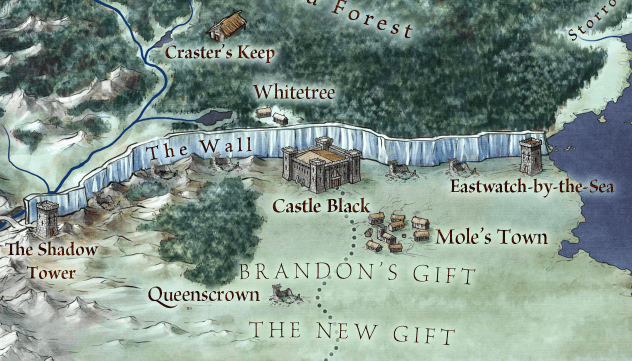 This is the first castle we explore in the books, with it’s two curtain walls, great keep, first keep and the Godswood. The Wolfswood crowds in close against the castle to the west. North of Winterfell we reach the limits of the Seven Kingdoms – the Wall. This is a smaller scale than the detail we get in the Beyond the Wall map, but we still see Castle Black, the Shadow Tower and Eastwatch-By-The-Sea, along with the ruins of Queenscrown, the Gifts and Mole’s Town. And then there’s the Wall – a ribbon of ice locking out the wild that lies to the north and protecting the lands of men. As winter is only just looming on the horizon in the books, the lands north of the wall are still green, but the first snows are falling. At the other extreme we have Dorne – a dry arid Kingdom that sits on the edge of the wars of the Seven Kingdoms. The fertile lands tightly hug the rivers, and the people are an exotic bunch compared to the standard knights and ladies of the rest of Westeros. 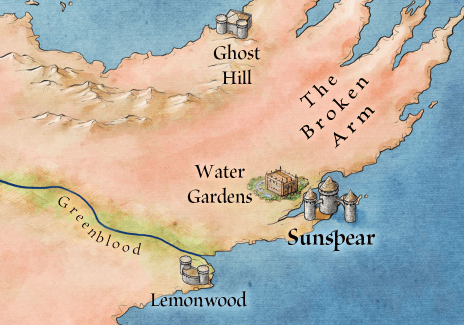 Here we have the castle of Sunspear and the Water Gardens located to the north of the Greenblood. And I couldn’t resist this little detail. The Fingers were clearly named after their resemblance to a grasping hand. And the paps, well let’s just say they also bear a striking resemblance to their namesake. To see the rest of the castle details (Highgarden! King’s Landing! Storm’s End!) you’ll need to grab the full poster map folio. I know I said Braavos was the map the blew me away the most, but I still think this one of Westeros is my favorite. It’s the one I have framed and hanging up at home, and it never fails to stun my friends (show watchers but not book readers) when they come over. Also, I love that you included the Tower of Joy and High Heart, but my favorite part is the North. I had so much fun illustrating the castles for this one. It really was a pleasure to do. Sorry for the delay – it’s been a busy week or two. I’m glad you like them! I agree with the creases. Personally I don’t mind the creases, but we ended up framing Beyond the Wall to keep it up and pretty. As for de-creasing – I’m afraid I’m at a bit of a loss on that one. Simply stunning work! I’m going to have to pick up this map poster book on Amazon. I love all your hand-crafted city symbols. The art style reminds me a lot of Campaign Cartographer 3, but of course you can make great looking symbols. You’ve been a very busy man!!! Hi, where can I buy this map in the UK?